Info and notifications about your Wi-Fi connections. Is there a better alternative to Debookee Tools? Is Debookee Tools really the best app in Internet Utilities category? Will Debookee Tools work good on macOS 10.13.4? Debookee Tools is a menu-bar application which shows you information and delivers real-time notifications about your Wi-Fi connections. Debookee Tools needs a review. Be the first to review this app and get the discussion started! Debookee Tools needs a rating. Be the first to rate this app and get the discussion started! You can configure it to start automatically on OS X launch. 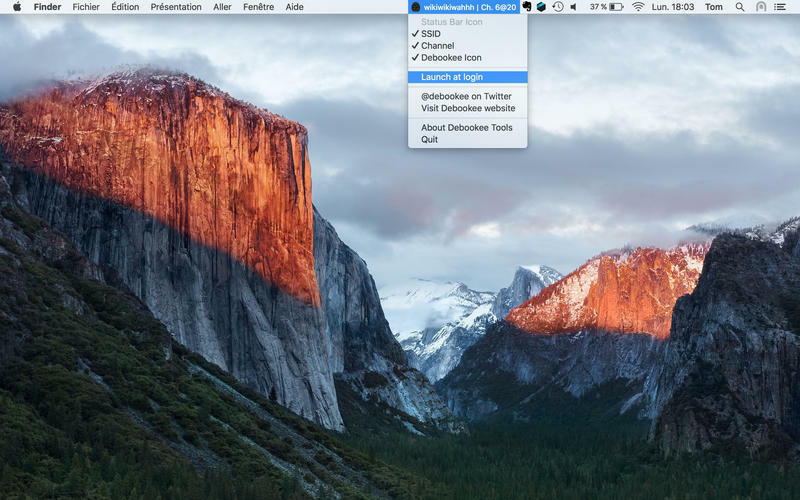 Optionally, SSID, channel and icon displayed in the menu bar. You can delete all icons in menu bar and leave the app running in the background. Redraw the icon by reopening the app.